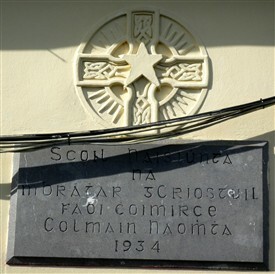 Detail of Ballinrobe showing Charter School. Bronze sculpture of John King 1865-1938 by Mr. Rick Lewis. The weighbridge and site of wool store can be seen in the distance behind. 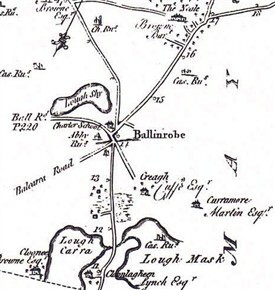 Ballinrobe must have had an effective and important representative to lobby the King as the granting of a Charter was fiercely fought over by other towns and also marks the importance of Ballinrobe as the major town in South Mayo at that time. 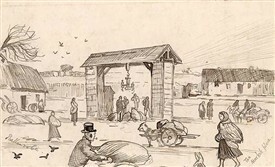 These markets and fairs brought traders and buyers from long distances, which required extra supplies of food and accommodation which was a good source of income for the town and an important step in increasing its economic development. It was common to seal deals, on purchases of cattle, sheep and other livestock by retiring to a local shebeen, pub or inn. Another site relating to animals was the Pound - see map. In the centre of Cornmarket is the weigh bridge which was used to weigh corn and other produce. The bridge has retained much of its original character and is one of the few remaining in the country. Many abuses were practised at markets in the weighing of corn. Frequently, the weights included stones of various sizes, pieces of iron, or lead, or mutilated weights. The seller might not even know the weight of their products, as very few had scales at home, and even if they had, little notice would be taken by the infallible clerk of that weight. Various allowances were made for sacks, dirt etc., and the ipse dixit (he himself said it) of the person, who attended the scales, must have been an irritation to the poor farmer. Sacks were of such various weights, it was usuallydecided that the fairest way to deal with this problem was to weigh all the full sacks, then empty them and throw them all into one scale, and then deduct their weight from the gross one. No wonder there were long queues with slow progress on market days which, no doubt, left plenty of time for exchanging news or having discussions or arguments. Weaver’s Row, was a row of single story, thatched cottages, built to accommodate the weaver’s brought to the town to improve a commercial venture in the locality. These houses no longer exist but modern homes/businesses still retain the same street line. Weavers from both Ballinrobe and outlying districts like Partry sold their hand-woven linens, tweeds or flannels close by at the end of Market/Main Street on market days. 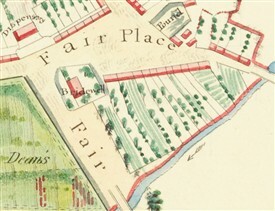 Flannel and tweed was sold by the bandle rather than the yard. The bandle differed from places to place, with the yard being thirty-six inches, compared to the bandle’s twenty-seven inches lengthand in some areas 20 inches. Sometimes a measurement for a bandle was made up by using seven fingers four times, which made thirty two inches depending on the size of the hand! One would need a sharp eye to get a good deal. Lace makers sold their lace by ordinary lineal measurements in this area also. The Dispensary, formerly the Charter School illustrated on Taylor and Skinner’s 1778 map the later site of the Christian Brothers living quarters. 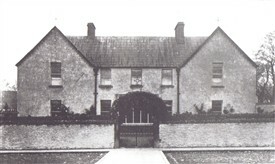 Canon James Ronayne is credited with bringing the Christian Brothers to Ballinrobe in 1876. Behind this building at right angles was the Boys’ Secondary School. The roof may seem to have a very steep pitch, and this is because this roof was removed from the old RC Church on the Castlebar Road, which fell into disuse when the new St. Mary’s was build in a more central situation on Main Street. Most of the original timbers and slates were reused and are still in situ on this building to-day. 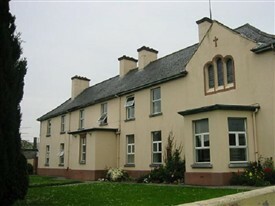 At right angles to this building is the school erected in 1934 and used as St. Coleman’s National School for boys. The Bridewell, established c 1760s was the site of many hangings and the town stock. 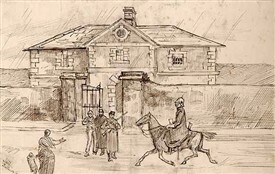 It was located near the corner with the Neale Road and the Bridewell (jail) contained four cells, three day-rooms, and two airing yards, with other requisite rooms/accommodation. In 1885 during the Assizes it was decided that premises would be sold, following which, it was advertised and sold in 1886 to the Rev. Canon James Ronayne for £80.00. There were two exercise yards adjacent to the Jail. Following a fundraising effort by selling 5000 shares at £5.00 each the building was purchased and converted into the Town Hall. 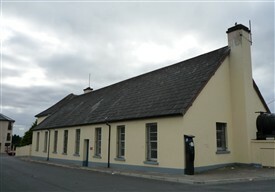 The conversion housed public reading rooms, an assembly room and many political, religious and social events were held there over the years. Plays, Operas, Courts, Balls, Drama Festivals, Musical Events, Boxing Matches, Billiards, Snooker and Card games were but a few of the activities that gave great pleasure to people. Obviously the adjoining exercise yards were built upon at a later date (further information required here if anybody would like to pass it on.) 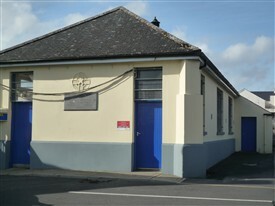 Up until recently the larger building facing onto the Cornmarket housed the Fire Brigade Station with a large hall behind. In 1901, according to the Ballinrobe Chronicle, a meeting was held in the Town Hall, in December 1901, to promote the study of the Irish Language and to establish a Gaelic League. The old town hall which was torn down during the Celtic Tiger period deserved a book to itself. 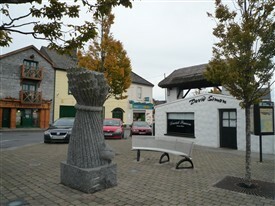 The stone sculpture ‘The Sheaf’ was commissioned from the artist Jackie McKenna by Mayo Co. Co for the ‘Cornmarket Regeneration Project’ c. 2002. The area was” returned from a casual to a dedicated civic space and is appreciation by the local community”. It is now an attractive central focus for the town with seating and newly planted trees. Information boards in the area are sited near the weighbridge at the centre of Cornmarket. The stone faced, three story wool store with its lifting wheel is now Hynes’s Pharmacy and the fanlight over Patsy’s Murphy’s front door beside the Centra store retains damage from a bullet during the ‘troubles’. John King (1865 – 1938) is only one of nineteen men that received two Congressional Medals of Honour from the US Navy. 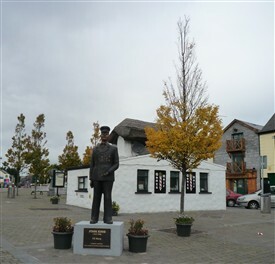 He was born in Currabee, Ballinrobe just about a mile out the Kilmaine Road in 1865 and, like so many more young people emigrated to the United States as a young man. He enlisted in the American Navy in 1893 where he and spend 26 years. He first served on the USS Vicksburg and worked in the boiler rooms of 13 other naval vessels amongst them the USS Massachusetts based in the Caribbean during the Spanish – American War. In 1900, he was transferred to USS Vicksburg where he served during the Philippine-American War. In 1916 he was discharged but was recalled in 1917 following the outbreak of World War One. He served two more years and received his final discharge in 1919. John King died in 1938 in the USA and is buried in Hot Springs, Arkansas. The US guided missile armed destroyer, the USS John King (DDG-3) was named after him, and was commissioned in 1961. The seven-foot bronze statue was sculpted by the well known and popular sculpture Rick Lewis who lives locally and erected in summer 2010. Some of Rick’s work is owned by Queen Elizabeth 11. This page was added by Averil Staunton on 04/02/2011. My Great Grandfather, William Henry Blackmore, OBE, lived at No. 6 Cornmarket when he was a loco driver for the Midland Great Western Railway Company. Most of my Great Uncles and Grandfather were born whilst living there in the early 1900's.